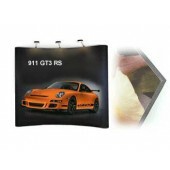 Straight tradeshow displays that hold backdrops are a wonderful option for creating an impressive presentation and differentiating your business from other companies. Choosing and using high quality backdrop displays is the best way to have a presentation that advertises you in the most flattering way. What are Straight Backdrop Displays? 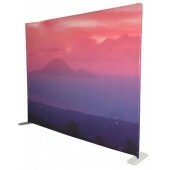 These displays come in a wide range of sizes. The feature makes those highly customizable and suitable for all kinds of business presentations. 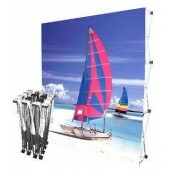 Straight backdrop displays could be made of PVC panels or metal frames. For convenience, these display materials can be equipped with additional features. Magnetic strips make the attachment of backdrops a simple task. There could also be a rolling trolley and spotlights. The selection of the right display depends on the type of fair you will be participating in and the specifics of the presentation. 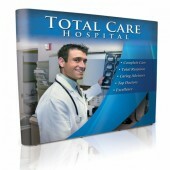 As already mentioned, these promotional materials are highly customizable. 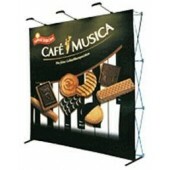 You can have them created in any size that will correspond to the backdrops you are planning to make use of. 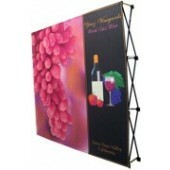 The metal frame or the PVC that that the display us made of will guarantee durability. Both of the materials are long-lived. Once you invest in your backdrop displays, you will get to use those time and time again. Frameworks themselves are exceptionally lightweight to simplify and speed up the transportation process. The rolling trolley that could come as an additional feature enhances moving the backdrop display even further. 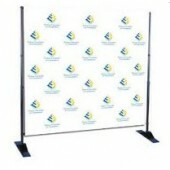 The straight backdrop display is a promo material that will be used time and time again. This is why you need to do a little bit of thinking and research before choosing the way in which you will be representing yourself during trade shows and fairs. The size is the first element you should think about. Most models and varieties are available in a range of sizes, which gives you choices but it also makes the selection a little bit more difficult. 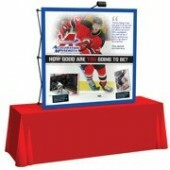 Straight backdrop display stands could be purchased with or without custom graphics. You can choose either version. Having the graphics printed professionally is as important, as choosing a high quality display made from a sturdy material. Finally, you should examine the finishes that such frameworks come with. Matte or glossy finish - it is up to you and to the style that you are looking forward to. All of these characteristics will be determining for the price but remember that straight backdrop displays are really affordable and long-lived. Presenting yourself in the best possible ways during trade shows will help you find new customers and business partners. A beautiful backdrop can enhance your presentation tremendously. Spend some time exploring the possibilities and picking the one will result in the most attractive visual.